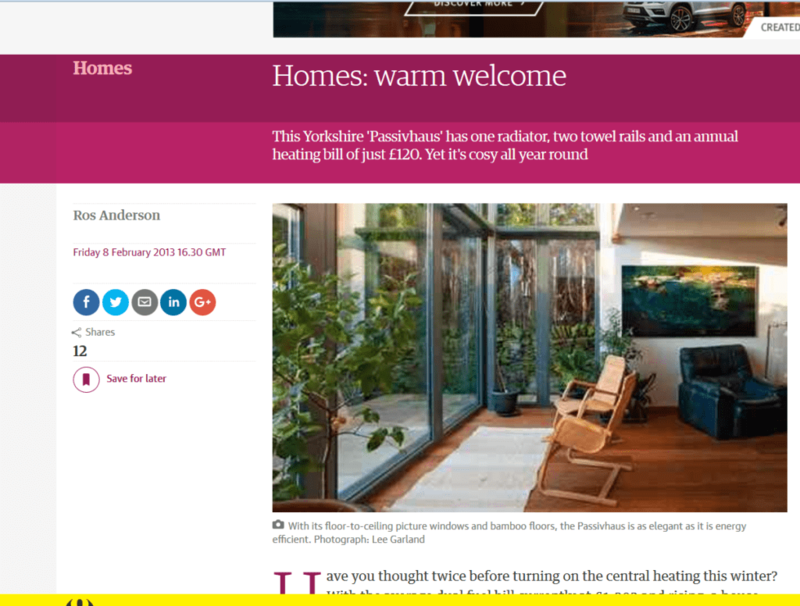 Green Building Store’s low energy Denby Dale Passivhaus project is featured in today’s issue of the Guardian Weekend magazine (Saturday 9th February 2013) in the SPACE section. The article features some beautiful new photographs of the ultra low energy house, combined with an in-depth interview with owners Geoff & Kate Tunstall. The Tunstalls are ‘Passivhaus pioneers’ being one of the very first private individuals to test out the German methodology and standard over here in the UK. They have now lived in the house for over two years and the low energy performance of their home has been extensively monitored. The Tunstalls’ generosity and openness in sharing their experiences of living in a Passivhaus has contributed to the growing popularity of the Passivhaus standard and methodology in the UK.